James Flanagan was born in 1817 in Ireland; his father was named Alexander and his Mary. He died on 8 March 1876, aged 60 years. 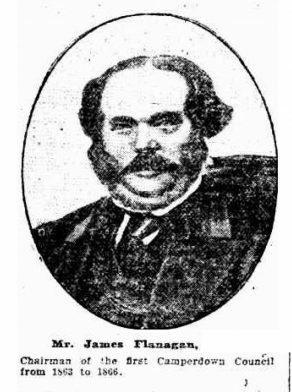 James Flanagan was an alderman on Cook Borough from 1863 to 1866, and mayor in 1863 and 1866. Flanagan presided over a public meeting at Camperdown on 11 February 1867 to form a School of Arts. By 1872 the defunct School of Arts bequeathed its books to the Free Library.